Hyrule Field serves as the opening stage of the game and serves somewhat as a tutorial. 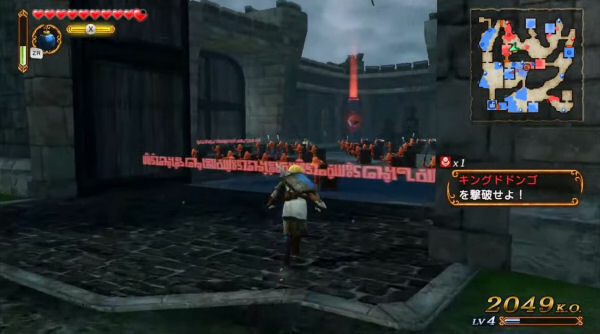 The enemies consist mostly of simplistic Bokoblins. Defeat enough enemies for the gate at the northwest to open up. Wear down Volga to trigger a cutscene and open the door to the north. Travel to the northwest corner of the map and defeat the enemy Lizalfos. Walk through the door to the northwest and open the treasure chest here to get the Bombs. Use the Bombs to blow up the boulders that block the exit. 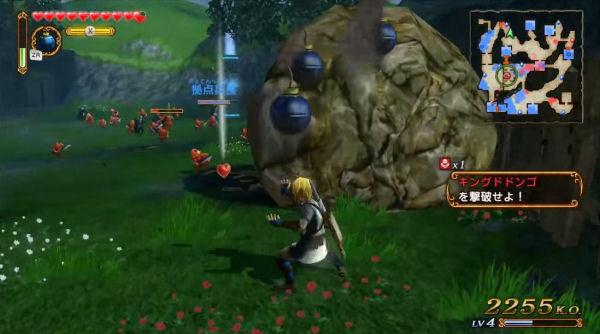 Make your way to the center of the map where the blue flag is shown, breaking pots and blowing up boulders along the way. Defeat the enemies to regain the center base. There are enemy strongholds near the center and east parts of the map. Run over and defeat them. Make your way to the southeast corner of the map and blowup the boulders. The flag will slowly move towards the triforce logo on the map. With the enemy strongholds defeated, you will be able to summon the Great Fairy who will upgrade the bombs. Return to the center of the map where the blue circle is shown and King Dodongo will appear. Wait until Dodongo opens his mouth and toss Bombs inside. Slash him with the sword and repeat the process until he is defeated. You can use magic to power up your attack and quicken the process. 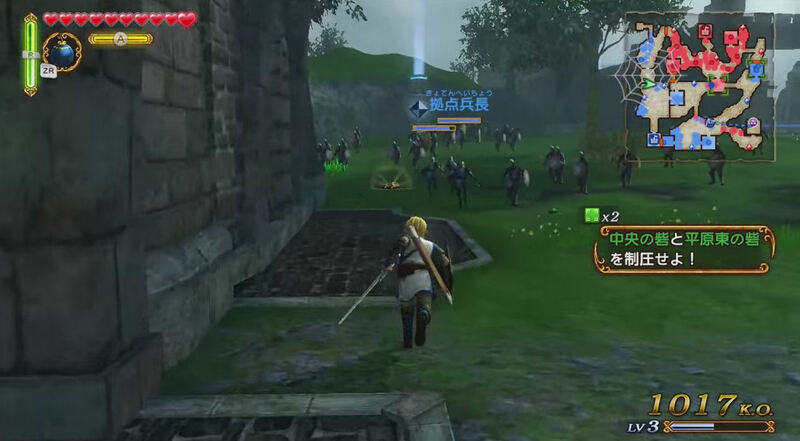 Run to the north end of Hyrule Field to trigger a cutscene. King Dodongo: King Dodongo attacks by jumping or swiping his paw forward. These attacks deal damage in a small radius, so keep your distance to avoid being hurt. He will also spit fire, which can be avoided by rolling out of the way when you see him raising his head. To defeat Dodongo, you must wait until he opens his mouth, giving you the opportunity to toss bombs into it. This will cause King Dodongo to fall down, allowing you to slash at him with your sword. To speed up the process, you can use magic to deal even more damage while he’s vulnerable. After losing a large amount of his health, the boss will attack by rolling towards you. Avoid this by quickly rolling out of his path, as he will not change direction mid-roll. Continue bombing his open mouth when possible, and slash away at him until he is dead. Gold Skulltula: After accumulating 1000 kills, a Gold Skulltula will appear on the west side of the map. There is a square region here and the skulltula is located just outside to the southeast. Piece of Heart: During the first half of the level, or after King Dodongo appears, you can access the north end of the map. 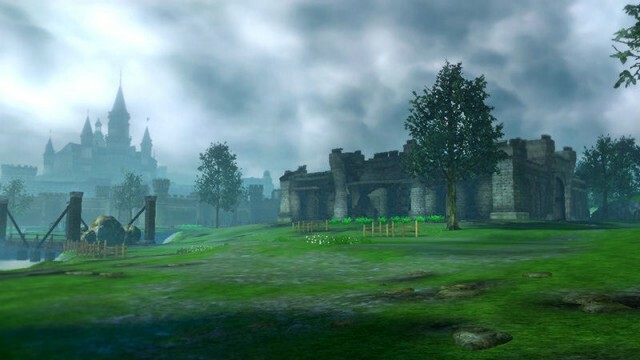 There is a small, enclosed square-region to the west in this area, and if you take control of the stronghold, a treasure chest will appear containing the Piece of Heart. Heart Container: After accessing the north end of the map, travel to the northwest area and use a bomb to blowup a boulder. Open the treasure chest to get a heart container.